Milkmaid. An Old Song exhibited & explainedin many designs by R. Caldecott. “I'm going a-milking, Sir,” she said. “Oh yes, if you please, kind Sir,” she said. “My Father's a Farmer, Sir,” she said. “Oh thank you, kindly, Sir,” she said. “Nobody asked you, Sir!” she said. 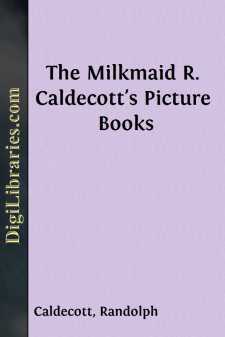 RANDOLPH CALDECOTT’S Collection of Pictures and Songs No. 1 containing the first 8 books listed above with their Colour Pictures and numerous Outline Sketches. RANDOLPH CALDECOTT’S Collection of Pictures and Songs No. 2 containing the second 8 books listed above with their Colour Pictures and numerous Outline Sketches. The Published Prices of the above Picture Books can be obtained of all Booksellers or from the Illustrated Catalogue of the Publishers.